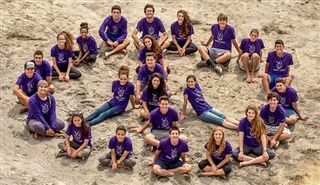 Pacific Ridge upper school service learning group Hands of Peace supports the national non-profit organization of the same name in developing peace building and leadership skills among Israeli, Palestinian and American teens. On February 9th, nine Hands of Peace members visited Seacrest Village, a North County retirement community, to deliver a presentation about the organization's mission and programs. Many of Seacrest Village's residents are of Jewish descent, and those who had visited Israel were encouraged to bring along a picture or artifact from their trip. Students loved hearing the residents' fascinating stories and sharing perspectives on a country that has undergone such dramatic change.